Every day, someone in my family asks, “What’s for dinner?”. It seems like a fairly innocuous question, yes? I mean – the small people and my husband a) know they are going to be hungry at the end of the day, b) know I’m typically the chef/master of meals in the home and c) are aware that I need to work around the ever-rotating schedule of sports that require us to run out the door each night. This means, I’m often scrambling to get everyone fed before practice or a Wednesday night double-header. I would love to tell you it is easy, but I would be lying. However, my goal is to alleviate that stress – at least a few nights a week. How? With One Pot Meals that take less time AND can satisfy my family’s hunger. 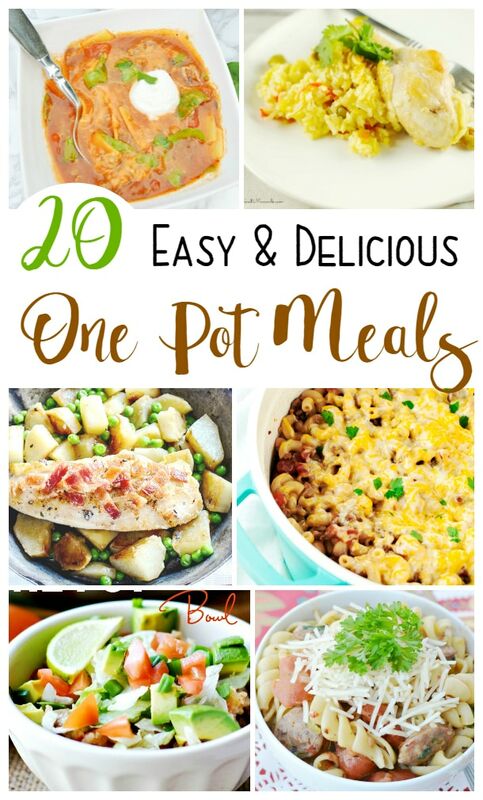 So, here is a collection of 20 easy one pot meals. Check out a few of my favorites below: Pizza Pasta, Creamy Spinach Chicken, Teriyaki Chicken and Pineapple Rice and Lemon Shrimp Pasta. Enjoy! Do you have a favorite on this list? Or one you’d love to share? I’m ALWAYS open to new and delicious options. Please do let me know. And if you would like to plan ahead for a busy night – here are five fabulous slow cooker meals to add to your dinner rotation. This is a great looking round up of recipes. I have shared this with my faceook group and pinned this to share. Thank you so very much, Stephanie – I so appreciate it.